E-Discovery has become and essential part of Litigation matters these days. However, E-Discovery requires Techno legal Acumen so that both Technical and Legal issues can be effectively handled. In fact, E-Discovery has become an essential part of the Legal Management System of India to ascertain irregularities and frauds in a timely manner. For the time being, we have no E-Discovery Law in India. The Information Technology Act, 2000 (IT Act, 2000) is the sole Cyber Law of India. Although it contains provisions pertaining to Electronic Documents and Secondary Electronic Evidence yet it is silent upon the aspect of E-Discovery. Even the Legal and Judicial Fraternity needs Scientific Knowledge about fields like Cyber Law, Cyber Forensics, Digital Evidencing, etc. Presently, Police, Lawyers and Judges lack the required Techno Legal Skills to solve complicated Cyber Crimes. There is an urgent need to provide qualitative Techno Legal Trainings to Law Enforcement Agencies, Judges, Public Prosecutors, etc in India. E-Discovery and Litigation Services is a very important aspect of Knowledge Process Outsourcing (KPO) and Legal Process Outsourcing (LPO). However, it requires good quality of Techno Legal Expertise to perform E-Discovery in a Legally Sustainable Manner. The LPO and KPO Providers of India must be Innovative in order to get maximum benefits out of this upcoming field. E-discovery has many purposes to achieve. It can be used as an effective measure to prevent frauds from being committed by timely detection of suspicious activities. It can also be used for detection of these frauds and crimes after their commission. Thus, e-discovery is both preventive and curative in nature. Further, E-Discovery for Due Diligence by Banks in India is also one of the contemporary requirements. 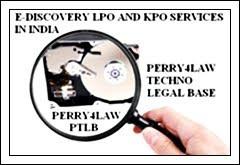 At Perry4Law and Perry4Law Techno Legal Base (PTLB) we are managing the Exclusive Techno Legal Digital Evidencing and E-Discovery Centre of India. It is taking care of Innovative Digital Evidence LPO and KPO and other Techno Legal Digital Evidencing and E-Discovery related issues. We are also the Exclusive Citizens to Government (C2G) LPO and KPO Providers in India. Perry4Law and PTLB are in the process of launching many more Innovative LPO and KPO Services in future. All those interested in having Partnership and Collaboration with Perry4Law and PTLB may send their proposals to us. Perry4Law Organisation is the umbrella organisation under which all other segments of Perry4Law operates. You may be interested in reading Perry4Law's Organisation Blog for more details. This Blog intends to cover areas like Legal Process Outsourcing in India (LPO in India), Knowledge Process Outsourcing In India (KPO in India), E-Discovery and Litigation Services LPO and KPO in India, Citizen to Government LPO and KPO in India (C2G LPO and KPO in India), Innovative LPO and KPO Services in India, Techno Legal LPO and KPO Services in India and many more such issues. Perry4Law Techno Legal Base (PTLB) is one of the best Techno Legal Segments of World’s Exclusive Techno Legal Law Firm Perry4Law. PTLB provides Exclusive Techno Legal LPO Services in India and Techno Legal KPO Services in India and World Wide. PTLB’s LPO and KPO Services Segment manages these Highly Specialised and Domain Specific Techno Legal LPO and KPO Services for Perry4Law. For more information, kindly see the Services Segment of PTLB.